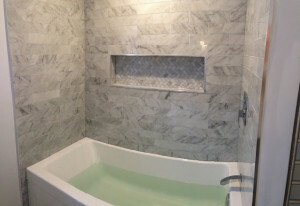 Ottawa bathroom renovation: three actual client estimates. If this is your first time renovating, or if it’s been a while, it can be hard to estimate cost. Below are three actual bathroom renovation estimates prepared for Ottawa clients. Remove shower, toilet, sink and flooring (drywall to remain). Materials cost below includes new sub floor, Schluter DITRA polyethylene membrane, shower enclosure, sink, fan, paint, trim and other building materials. 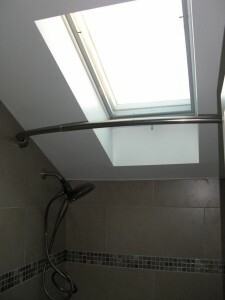 Client supplied tile for shower and floor. Re-used existing toilet. Time needed: 8 working days. Two Bathroom Renovations in Vanier. Complete bathroom gut back to the studs and sub floor. Enlarged the bathroom by claiming space from an adjacent room’s closet. Materials cost below includes large shower base, glass shower doors, under-tile heating, large shower base, glass shower doors, under-tile heating, other building materials. 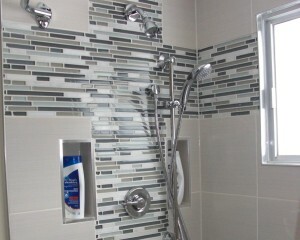 Client supplied wall and floor tile, toilet and vanity. Complete bathroom gut. Materials cost below includes new insulation and vapour barrier, under-floor heating, airflow tub and dual-function shower, shower tile (with recessed shelves), floor tile, low-flow toilet, vanity, window, paint, trim and other building materials.